Da Capo Lifelong Books, 9780738219479, 320pp. There is a fundamental connection between the brain, the gut, the microbiome, and the thyroid: if any one part of this system is malfunctioning, it will impact the others--and this is where The Whole Brain comes in. Integrative health pioneer Dr. Raphael Kellman presents his revolutionary concept of "the whole brain" (a biological system made up of the microbiome, the gut, and the thyroid). 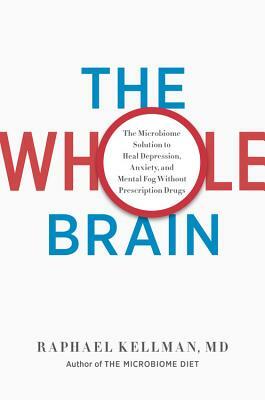 Kellman then shares a completely new approach to curing depression and other mood problems by focusing on this interconnectedness, explaining how this system works in tandem to heal mood and mental disorders without drugs. Based on Dr. Kellman's decades of experience as a physician and his ongoing study of the latest science, the book offers a lively, accessible explanation of how the brain works and why, for optimal brain health, you need to heal the microbiome, the gut, and the thyroid. With a proprietary three-week plan (21 days of meal plans, featuring 50 original and simple recipes; a complete exercise program; and a program of daily meditations and affirmations). The Whole Brain program will benefit people diagnosed with depression and/or anxiety as well as those who just want to feel better. An internist and pioneer in holistic medicine, Raphael Kellman, MD, is the founder of the Kellman Center for Functional and Integrative Medicine. Dr. Kellman lives with his family in Manhattan.